Hospitals often have hundreds of vendors or employees using their healthcare IT systems remotely, leaving their networks and PHI vulnerable to malware, viruses, and unapproved access. See how SecureRamp™ can simplify remote connectivity, ensuring secure access to your network and PHI. 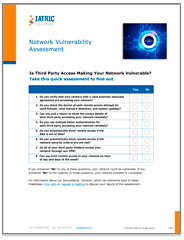 Assessment: Is Third Party Access Making Your Network Vulnerable? Deny partners access for out of date BAAs and receive notifications for BAAs requiring review. Prevent unauthorized access by demanding two or more pieces of evidence for authentication. Reduce burden on IT staff by shifting the management of third-party access to Iatric Systems. Make your network more secure by having all third-party access come through one VPN tunnel. Reduce the possibility of malware or ransomware attacks. Gain total visibility into third-party vendor access. Get the critical information you need for upper management or auditors. Determine if third-party remote access is making your network vulnerable.